The phrase "category killer" has been used a lot in retail and has two basic meanings. The first refers to a retail store. The second refers to a product in that store. The term is not meant to be flattering, as it is calling out the fact that this store "kills" other stores or that this product "kills" other products. The "mom and pop" retail stores struggle mightily against these types of retailers. At its core, a category killer is a retail chain store that is dominant in its product category. While it could be a single store, this is not common. This type of store generally offers an extensive selection of merchandise at prices so low that smaller stores cannot compete. These stores are larger in physical space and try to "own" the category of merchandise they sell. For example, Best Buy would be considered a category killer for consumer electronics. Bed, Bath, and Beyond would be considered a category killer in home interior needs. Its sister store, BuyBuy Baby, would be an example for the baby needs category. Independent retailers struggle against these types of stores. A category killer typically has much larger marketing budgets, much broader inventory selection (since they have a larger balance sheet), and can withstand an economic downturn with more stores to carry the financial load. The advantage of a category killer is that its selection and prices typically overpower the smaller stores. 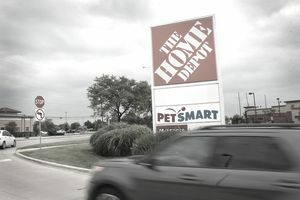 Home Depot has almost seven times the square footage and inventory of the local hardware store. So, if you are looking for a drawer knob for your kitchen cabinet, you would find tons more at the category killer store. In addition, because of the volume of sales in the category killer store, the prices tend to be lower. The volume purchasing means that the retailer gets better terms and dating on its purchases, and that translates into lower prices in the store for the customer. Sometimes, retailers are referred to as category killers because of their pricing and dominance in a market. Walmart is the best example of this type of store. Its purchasing power allows it to offer lower prices and while the selection in the store is not the "best" in any given product category, it does tend to "kill" the independent stores in the area when it opens. But today, we can have a category killer online as well. While Amazon.com is the first to come to anyone's mind, there are many others. For example, TigerDirect has been the leader in electronic sales and parts for its category for quite some time. Zappos (who was bought by Amazon just a few years ago) redefined shoe shopping online. Google's parent company Alibaba, however, is the worldwide leader in online sales, eclipsing even Amazon. The second type of category killer is a product sold in these stores. The most famous is probably the iPad. Its dominance in the marketplace is incredible. In fact, many have taken to calling all tablets iPads. In other words, it's common to hear a child refer to any tablet as an iPad. While many players have entered the tablet market over the years, few have any sustained presence. Category killers get their name because they tend to knock out the competition in the surrounding market. Their power from purchasing and operational efficiencies and economies of scale make it a tough battle for retailers. However, today's customer is looking for something more than just a low price and the independent retailer can still survive if they have a good strategy.